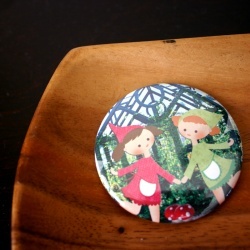 Slip this pocket mirror into your purse or uh, pocket, and you'll be prim and pretty 24/7! A great companion for our matching tote or noteflats! Other Info: Mirror measures 2.25" and comes with a velour pouch.